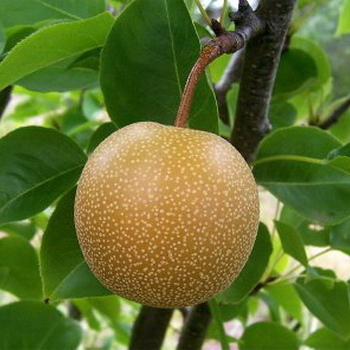 The Asian pear is often called “pear apple” although it is not a cross between an apple and a pear. Rather, it is the descendant of two Asian species of pear. The fruit is sweet and juicy, often described as refreshing. Most that we find in the U.S. are Japanese varieties which are round. Most Asian pears do not require as many hours of cold as the European pears, but they can withstand frost. Asian pears are somewhat less susceptible to the bacterial disease fire blight (Erwinia amylovora) which can be a problem for European pears. Certain varieties such as Shinko and Kikusui exhibit more resistance. This disease is more prevalent in certain parts of the country. Check with your local ag or horticultural experts if you are in doubt about your area. Coddling moths can also be a problem. They attack apples and European pears as well. Pheromone traps can be useful indicators of their presence and, thus, the most beneficial time to spray. An important deterrent is a thorough cleanup in the fall. Be sure to remove all old fruit and leaves on the ground. Asian pears grow about 25 to 30 feet tall and half as wide, but they can easily be kept smaller with pruning. White blossoms appear in the spring, normally followed by a heavy crop of fruit. Thin to one fruit per spur or you will have many very small Asian pears! Fruit matures late in the summer or early fall. You can usually tell if it’s ripe when it begins falling to the ground. The fruit is sweet when ripe, rather tasteless before. Unlike European pears, the fruit is ready to eat when picked at the ripe stage. Asian pears store exceptionally well. They do not cook nearly as fast as European pears and can be used in many recipes calling for apples. The fruit is a nice addition to salads. The following recipe has been adapted for Asian pears. Prepare a vinaigrette dressing by pounding a clove of garlic with ½ teaspoon of salt in a mortar until it forms a smooth paste. Add 2 teaspoons curry powder and ½ teaspoon fresh grated ginger. Then stir in 1 ½ tablespoons lemon juice or red wine vinegar. Then whisk in 6 tablespoons of olive oil. Combine two sliced Asian pears, 4 sliced beets (cooked with skins removed), one bunch of minced scallions and ½ cup chopped roasted walnuts. Toss with two tablespoons of dressing. Arrange lettuce, such as Romaine or butter lettuce on individual plates and drizzle remaining dressing on top. Standard rootstock for Asian and flowering pears, especially in warm winter, hot summer climates. Good for sandy or heavy soils. Heavy bearing at a young age. Unpruned tree height of fruiting varieties is fifteen to twenty feet. Tree may be held to any height with summer pruning. Chojuro, Hosui, Shinseiki and 20th Century (these four varieties) grafted onto one tree. Available on OHxF333. Medium sized Asian pear with smooth, thin skin and excellent quality. Juicy, sweet, with mild flavor; crisp like an apple when ripe. Easy to grow. Medium sized upright tree bears heavily; best to thin. Late bloom. Ripens in early to mid August; keeps well. 3-400 hours. Self-fruitful or pollenized by Shinseiki, Bartlett or other pear or Asian pear. Available on OHxF333. Medium sized Asian pear with thick, russetted, golden brown skin. Aromatic, crisp, firm, with very sweet flavor. Late bloom. Resistant to alternaria, black spot, scab. Ripens in mid August with heavy yields. 450 hours. Pollenized by Hosui, Shinko or other pear. Available on Call. Large, top quality fruit; high scoring in taste tests; perhaps the tastiest Asian pear. Juicy, very sweet, flavorful, refreshing, low acid. Brownish orange skin, russet type. Blooms late, ripens early to mid August. 3-400 hours. Pollenized by Shinko, Chojuro, Bartlett or 20th Century. Available on OHxF 333. Medium sized, juicy, sweet, crisp Asian pear with smooth, greenish yellow skin. Superb fresh eating, one of the best. Easy to grow. High yields, keeps well. Blooms late. Ripens mid August. Resistant to fireblight. 450 hours. Partly self-fruitful or pollenized by Ishiiwase, 20th Century or other. Available on Call. Late blooming and late ripening with excellent quality. Large, juicy, sweet, crisp, flavorful russet type Asian pear with greenish or golden brown skin. Variety most resistant to fireblight. Bears very young and then heavily every year; best with thinning. Ripens in September; keeps well. 450 hours. Pollenized by Hosui, Chojuro, Kikusui, Bartlett. Available on OHxF333. Juicy, sweet, mild, medium sized Asian pear with smooth, thin, bright yellow skin. Easy to grow. Keeps well. Harvest late July/early August. Vigorous, precocious, usually bears in second year; high yields. 250-300 hours. Self-fruitful. Available on OHxF333. Light to golden brown russet skin. Flesh has a sweet flavor and a finer texture than most Asian pears. Harvest in late August. 3-400 hours. Pollenizer required - any Asian pear will work. Available on Call.